Kolkata: The state Power and Non Conventional Energy department has joined hands with The Energy and Resources Institute (TERI) to work jointly for the achievement of common goals related to reforms in the state’s Power sector. A Memorandum of Understanding (MoU) was inked on Friday by Sunil Kumar Gupta, Additional Chief Secretary, state Power and NCE department and Ajay Mathur, director general, TERI at the 5th edition of Bengal Global Business Summit. The areas of collaboration are renewable energy planning, technical studies including grid integration studies, energy storage, electric vehicle charging infrastructure, distribution-side reforms and demand-side management (DSM) and energy efficiency. Integrated energy demand and supply projections and working on innovative solutions (including smart grids, agro-voltaics, floating solar PV etc.) are also a part of this list. 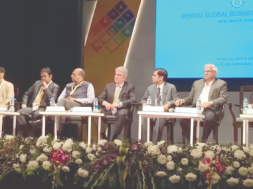 “Although Bengal is a power surplus state and has connected 100 percent households to the grid last year, the state government has still emphasised on technological innovations in order to improve the reliability and efficiency of the state Power sector. We are now developing a 1,000 MW pump storage in Turga, Purulia that will enable a balancing framework, especially to serve evening peak hours and emergency blackout situations,” said Gupta. TERI has engaged with public utilities across the country to bring more energy efficiency and smoother grid integration of renewables in the power distribution system through DSM, load research and battery storage. It will provide technical support and assistance to the state by engaging with the state utility and other bodies under the state Power department, through grid-integration studies. The results of studies and other planned activities will help facilitate the smooth uptake of more clean and green power in the state electricity grid and rising integration of renewable energy and electric vehicles.